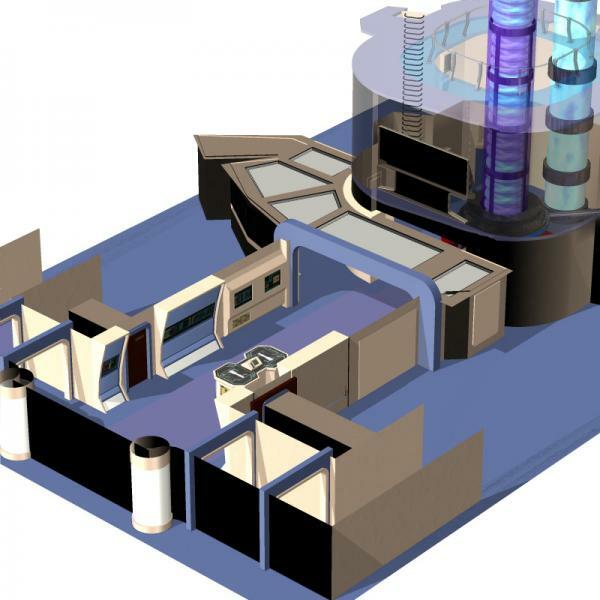 Introducing the next starship room for Poser: the Engineering Room 2. From this room, the crew can monitor all the energy functions of the ship. * Includes one Poser figure (obj, cr2/ png), at 69,582 polygons. * The right and left doors can open and close (with an ERC dial on the BODY). * This model uses Poser`s shader nodes for some materials. * All of the monitor screens use their own texture map, which makes it easy to change the screens and customize the room to suit the needs of your scene. * Hide/ show each wall and the ceiling. * Hiding and showing the left wall hides and shows the left doors, hiding the right wall hides and shows the right doors..
* Eight camera files are included. * Includes the Engineering Room 2 in the center of the scene. * The light set in the included scene file has Ambient Occlusion enabled for the top light.